LANSING — He’s a Northern Michigan gun owner. He describes himself as pro-hunting. And he remembers fondly the first firearm he ever owned. The person is Robert Kennedy of Harrisville. He ran as Democrat for a seat in the Michigan House in 2016. Guns became one of the big issues in the campaign. 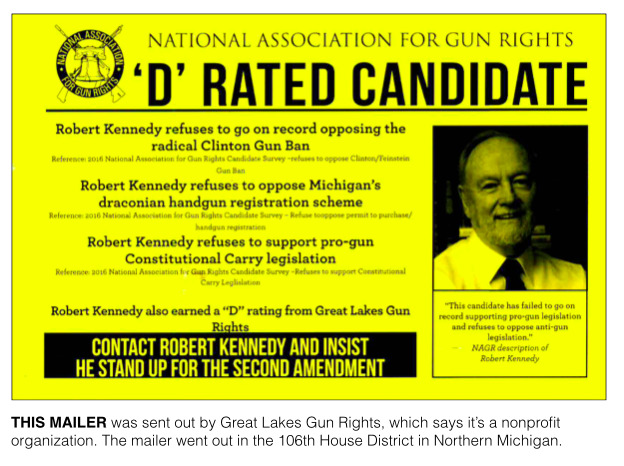 Not only did the National Rifle Association (NRA) endorse Kennedy’s opponent, but other groups repeatedly bashed Kennedy’s views on firearms in paid mail pieces sent directly to voters. Kennedy’s race in Northern Michigan’s 106th District is an example of how the fight over guns plays out on the ground in Michigan. It’s less about big checks written to powerful officeholders and more about lobbying, candidate surveys and strategic messaging directed at voters in a handful of key districts with some of those messages coming from groups with secret donors. As a mass shooting in Las Vegas re-energizes the national debate over gun policy, supporters of gun rights say the mail pieces and attack strategies are needed to educate voters about where politicians really stand. However, individuals who have been the targets of the attacks argue the groups behind them demand strict allegiance to their views and rely on fear as a motivator. Among the groups active on gun policy in Michigan is the national pro-gun control organization Everytown for Gun Safety, which includes Moms Demand Action. There are several groups working to promote gun rights in Michigan, including two national ones: the NRA; and the National Association for Gun Rights. There are also state-level, grassroots gun rights groups with engaged followers, including Michigan Open Carry, Michigan Gun Owners and the Michigan Coalition for Responsible Gun Owners (MCRGO). Brady Schickinger, the director MCRGO, says one of the reasons groups like his have been successful is because of how important gun rights are to their supporters. For voters who want more gun regulations, the issue is usually a secondary one when they’re picking candidates, he said. That’s not the case for those who want to protect gun rights. “That’s one of the main things that they take into consideration when they select a candidate,” Schickinger said. 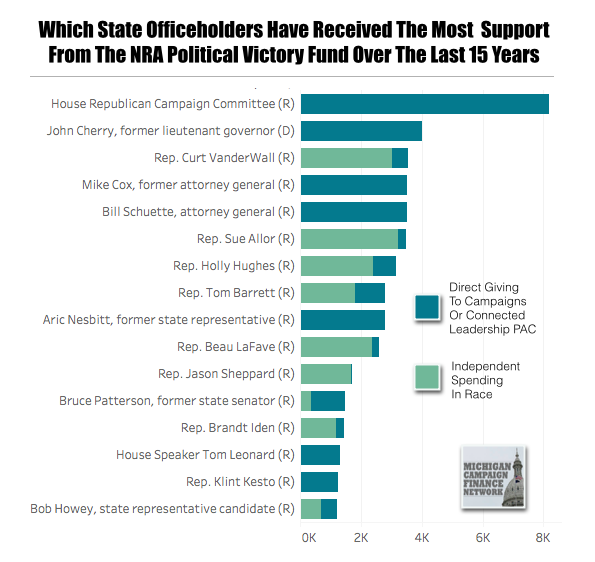 Of the groups mentioned above, the Virginia-based NRA has the most active political action committee in Michigan. Since the start of 2002, the NRA Political Victory Fund has disclosed spending $67,504 at the state level in Michigan. The PAC has given money directly to a handful of candidates each election cycle and has spent money independently, naming candidates on NRA mail pieces in certain key districts. The mail pieces are often in the form of postcards that tell voters about the PAC’s endorsements. The postcards are so well known here that some political operatives say they’ve seen others send out similar-looking postcards with similar messaging as a way to counter the NRA’s strategy. For the 2016 election, the NRA’s disclosed spending at the state level in Michigan was $25,133, the highest total for the NRA over the last decade but not high compared to the state's top spenders. The 2015-2016 money came primarily in the form of small contributions of $30 or less from Michigan residents. With more money, the PAC spent on mail pieces. For instance, the PAC reported spending $3,231 to distribute “endorsement postcards” in favor of Republican Sue Allor, of Cheboygan, Kennedy’s opponent in the 106th District. A similar amount, $3,035, was spent on postcards in favor of Republican Curt VanderWall, of Ludington, in the 101st District. In total, the NRA sent out endorsement postcards in 10 general election races in 2016. All of the postcards supported Republicans and all of them went out in competitive districts that both Republicans and Democrats were actively trying to win. In the Grand Traverse County-based 104th District, the NRA sent out postcards in a 2016 primary race i Republican Jason Gillman, of Traverse City, and incumbent Rep. Larry Inman, a Republican from Williamsburg. When Inman first ran for the House in 2014, he described himself as “pro NRA.” But in his 2016 race for a second term, the NRA gave him a “C” rating and disclosed spending $756 to distribute endorsement postcards in favor of Gillman, who described himself as a strong gun rights advocate. Inman said the NRA doesn’t like his belief that “guns don’t belong in schools.” Currently, in Michigan, a person with a license to carry a concealed weapon can carry a non-concealed weapon in schools. There have been repeated efforts in the state to change the law to allow concealed weapons in schools. Gun rights groups sent out multiple mail pieces favorable to Gillman in the primary and at least one robocall, Inman said. Inman still won the race with 59 percent of the vote. Gillman got about 40 percent. Inman said he’s not sure his position will allow him to get the NRA’s support in the future. The NRA didn’t respond to a request for comment on this story. And the NRA’s support can be crucial. Schickinger, who worked as a legislative assistant for Democrats in the Michigan Legislature before taking his job at MCRGO, said it’s not the contributions of gun rights groups that have the most effect but it’s the grades they give candidates in the run-up to an election. “In a Republican primary election, it can make or break a candidate,” said Schickinger, who added that receiving a good rating from the NRA can also be important to Democrats in certain districts. Kennedy, who lost in the general election, didn’t get the NRA’s support. But he also faced negative mail pieces on guns from the Michigan Republican Party, the Grand Rapids-based Great Lakes Gun Rights and the Colorado-based National Association for Gun Rights. According to its website, Great Lakes Gun Rights’ chairman is Brenden Boudreau, who is also listed as director of state affairs for the National Association for Gun Rights. Great Lakes Gun Rights says it’s a nonprofit with more than 75,000 supporters. The National Association for Gun Rights, a nonprofit, has described itself as the fastest growing gun rights organization. It has sent out mail pieces that didn't expressly tell readers to vote for or against a candidate, so the association didn't have to disclose the donors behind the pieces under Michigan law. “Contact Robert Kennedy and insist that he come clean about his position on anti-gun restrictions,” the mailer said. 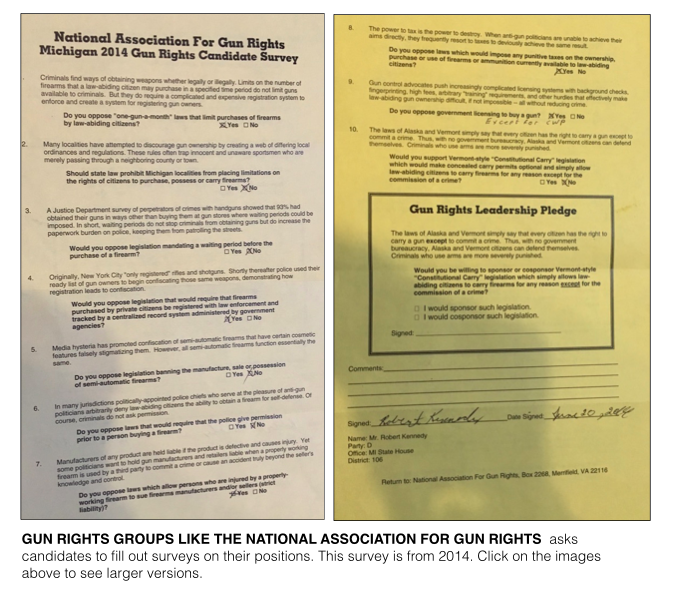 When Kennedy first ran for the Michigan House in 2014, he filled out a survey on his views for the National Association for Gun Rights but he decided not to fill out the survey for his 2016 race, he said. The association’s 2014 survey asked 10 questions, like whether candidates opposed “one-gun-a-month” laws limiting gun purchases and whether they opposed laws allowing people injured by properly working firearms to sue firearm manufacturers. Kennedy said he opposed both of those kinds of laws in his 2014 survey. Kennedy said he wouldn’t support making concealed carry permits optional and he declined to sign the leadership pledge. 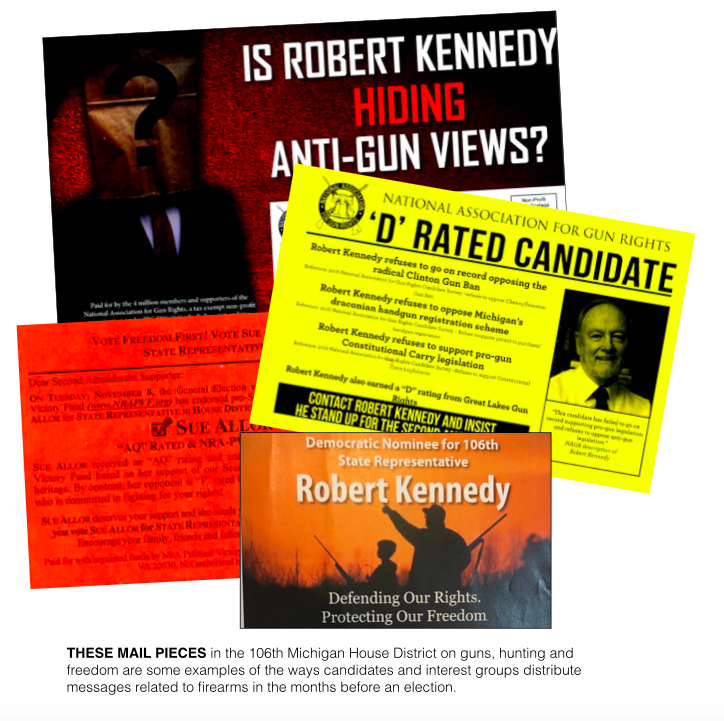 During the campaign, Kennedy and his supporters tried to counter the attacks by carrying Kennedy’s 2014 survey responses on gun control issues and the early mail piece with them when they went door to door. The National Association for Gun Rights and Great Lakes Gun Rights didn’t respond to requests for comment on this story. In Montana, the National Association for Gun Rights unsuccessfully sued in March 2016 to challenge the constitutionality of a law that required groups that mention candidates in ads and paid-mail pieces in the run-up to an election to disclose their donors. The association said the Montana disclosure law violated its rights of free speech and association, according to court documents. Tom Lambert, president of Michigan Open Carry, echoed that idea when he was asked recently about why so many gun rights groups grade candidates based on survey responses. “There’s a difference between saying you’re pro gun and being pro gun,” Lambert put it. It’s unclear how many Michigan races the National Association for Gun Rights was involved in 2016 because the association doesn’t have to disclose that information. The organization is also not registered to lobby in Michigan. The NRA, on the other hand, does lobby in Michigan. Since the start of 2012, it’s reported spending $78,830 on lobbying in Lansing. The NRA’s lobbying presence and campaign giving aren’t large when compared to many spenders in the state. Ben Miller, former constituent relations director for the Michigan House Democrats, said the gun groups make contributions just large enough that people notice and have a passionate group of committed supporters who will quickly react to something going on in the Capitol. “It has always amazed me that people don't see how much of an impact 20-40 well-placed calls a week into a legislative office have,” Miller said. Gun control advocates are also working to build their presence in Michigan. 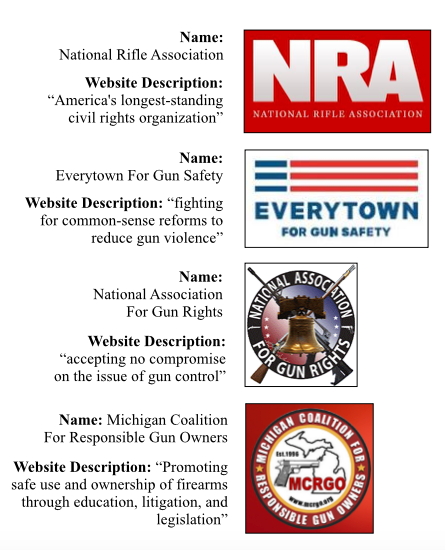 Everytown for Gun Safety, which describes itself as a “movement of Americans fighting for common-sense reforms to reduce gun violence,” registered as a lobbyist in Michigan on Oct. 30, 2015. Since then, the organization has reported spending $79,365 on lobbying — more than the NRA has spent over that time.